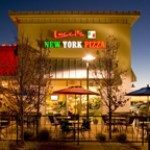 At Lucci’s New York Pizza each pizza is handmade with the freshest ingredients. Our sauces, dough and bread are prepared daily and made from scratch by our chef, Joe Angerame. Born and raised in New York City, Joe discovered his culinary talents as a child working at his Uncle’s pizzeria and learning his family’s secret recipes. For 30 years now he has continued his family’s cooking tradition and brings his delicious recipes to Santa Fe.